"MiG" and "Mikoyan" redirect here. For other uses, see MiG (disambiguation) and Mikoyan (disambiguation). Russian Aircraft Corporation "MiG" (Russian: Российская самолетостроительная корпорация „МиГ“, translit. Rossiyskaya samoletostroitel'naya korporatsiya "MiG") is a Soviet, and later a Russian aerospace joint stock company. Its head office is in Begovoy District, Northern Administrative Okrug, Moscow. The name "MiG" is formed as a conjunction of the names of its two founding designers, Artem Mikoyan and Mikhail Gurevich. MiG aircraft are a staple of the Soviet and Russian Air Forces, and the Soviet Union sold many of these aircraft within its sphere of influence. They have been used by the militaries of North Korea, North Vietnam, India and also in aerial confrontations with American and allied forces, and form part of the air forces of many Arab nations. It was formerly known as Mikoyan and Gurevich Design Bureau (Russian: Микоя́н и Гуре́вич, МиГ Mikoyan i Gurevich, MiG), then simply Mikoyan. Mikoyan was established on December 8, 1939 as the Pilot Design Department of the Aviation Plant #1 and headed by Artem Mikoyan and Mikhail Gurevich. It was later renamed "Experimental Design Bureau named after A.I. Mikoyan" otherwise known as the Mikoyan Design Bureau or Mikoyan OKB. In 1964 Gurevich retired, and Mikoyan died in 1970. He was succeeded by Rostislav A. Belyakov, and in 1978 the enterprise was named after Mikoyan. In 1995, Mikoyan OKB was merged with two production facilities to form the Moscow Aviation Production Association "MiG" (MAPO-MiG). In the 1990s MiG began developing Mikoyan Project 1.44, a fifth-generation jet fighter, but the project was hampered by a lack of funding and was eventually canceled. In December 1999, Nikolai Nikitin was appointed the corporation's General Director and General Designer. Nikitin focused most of the company's resources on the development of the Tu-334 passenger aircraft at the expense of military programs. This prompted the resignation in December 1999 of many of its leading military aircraft designers, including the chief designers and their deputies for the MiG-29 and MiG-31 programs. Nikitin was replaced by Valery Toryanin in November 2003, who was in turn replaced by Alexey Fedorov in September 2004. In 2006, the Russian government merged 100% of Mikoyan shares with Ilyushin, Irkut, Sukhoi, Tupolev, and Yakovlev as a new company named United Aircraft Corporation. Specifically, Mikoyan and Sukhoi were placed within the same operating unit. 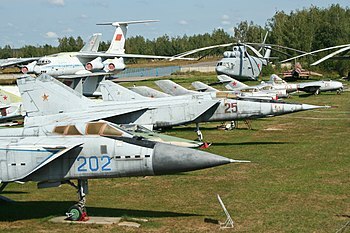 MiG failed to win any major aircraft tender in the post-Soviet era, falling behind its Russian rival Sukhoi. According to press reports, the company was shedding hundreds of employees in late 2017 due to a shortage of orders. As of 2015 the company's business offering consists mostly of modernized MiG-29 aircraft. MiG is developing a 4++ fighter, the MiG-35, with the first deliveries expected in late 2019. Another aircraft under development is the replacement for the Mig-31 interceptor, called Mig-41. ^ a b c d e https://www.kartoteka.ru/card/99dd489e634ddb77bb9a8e341d679368/4b70a2dccb5183bafb39cada91d498f1/. ^ "Contacts Archived 2011-09-21 at the Wayback Machine." Mikoyan. Retrieved on 30 August 2011. "Russian Aircraft Corporation "MiG" 125284, Russian Federation, Moscow, 1-st Botkinsky drive, 7" – Address in Russian Archived 2011-08-28 at the Wayback Machine: "125284, Российская Федерация, Москва, 1-й Боткинский проезд, д.7"
^ a b c d "Russian Fighter Aircraft Industrial Base: Parallels with the United States?" (PDF). Congressional Research Service. November 8, 2000. Archived (PDF) from the original on 29 August 2017. Retrieved 15 December 2017. ^ "MiG - Russian design bureau". Encyclopedia Britannica. Retrieved 16 December 2017. ^ Dowling, Stephen. "Rostislav Belyakov: The man behind the MiGs". BBC Future. Retrieved 16 December 2017. ^ "The State of the Russian Aviation Industry and Export Opportunities" (PDF). Conflict Studies Research Centre. Retrieved 16 December 2017. ^ Kramer, Andrew E. (22 February 2006). "Russian Aircraft Industry Seeks Revival Through Merger". The New York Times. Retrieved 16 December 2017. ^ "Ares". www.aviationweek.com. Archived from the original on 2010-03-21. ^ a b "Russia's Once-Mighty Fighter Jet Firm MiG Struggling as Rivals Make Gains". The Moscow Times. July 2, 2015. Retrieved 16 December 2017. ^ "СМИ узнали о сокращениях в корпорации «МиГ»". Lenta.ru (in Russian). December 1, 2017. Retrieved 1 December 2017. ^ "Начались госиспытания новейшего МиГ-35". Lenta.ru (in Russian). May 25, 2018. Retrieved 25 May 2018. Wikimedia Commons has media related to Mikoyan.